Yesterday my husband and I visited our niece Emily and her husband Phil. We had fun making crab cakes together for dinner and thought you might also enjoy making them. They make a meal special, but are easy to make….the secret is using good ingredients. The recipe I use is from CookSmart by Pam Anderson. 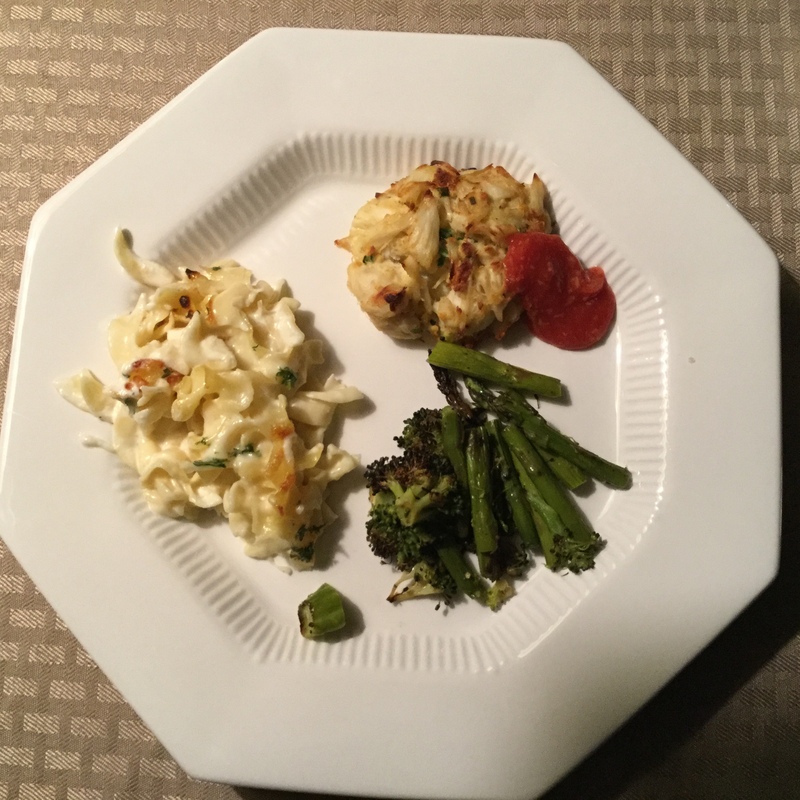 I use jumbo lump crab meat, it is a little pricey but a pound will serve 4 people. If you calculate the cost of a crab cake dinner for 4 out you realize that it is a bargain to make them at home. Place the saltines in a bag and crush with a rolling pin. If you don’t have a rolling pin be innovative and use a glass. Mix egg, mayonnaise, scallions, seasoning, and hot red pepper sauce in small bowl. Add milk and salt and pepper to taste; toss gently to coat. Add saltines; toss gently to combine. Add egg mixture; gently toss once again to combine. Let stand for about 5 minutes so crackers have a chance to soften. I broil my crab cakes instead of frying them as in the recipe. I line a cookie sheet with foil and spray with olive oil. I use a 1/4 scoop leveled to make each crab cake. I scoop it out of the bowl into my hand and then pat firmly into a cake. I place them on the cookie sheet. Lightly spray with olive oil and cover with plastic wrap and refrigerate until ready to cook. This helps them to stay together a little better when cooking and also allows you to make them ahead of time. Now you are ready to eat, fry, bake or broil them. You can fry following recipe. Bake at 375 for 15 to 20 minutes or broil for about 10 minutes. Of course these crab cakes taste even better when you are sharing them with someone you love. That recipe does not only look yummy but it’s also so easy to make! Thanks for sharing. Thanks Melisa, I love that you can make them ahead and they don’t take that long to cook.